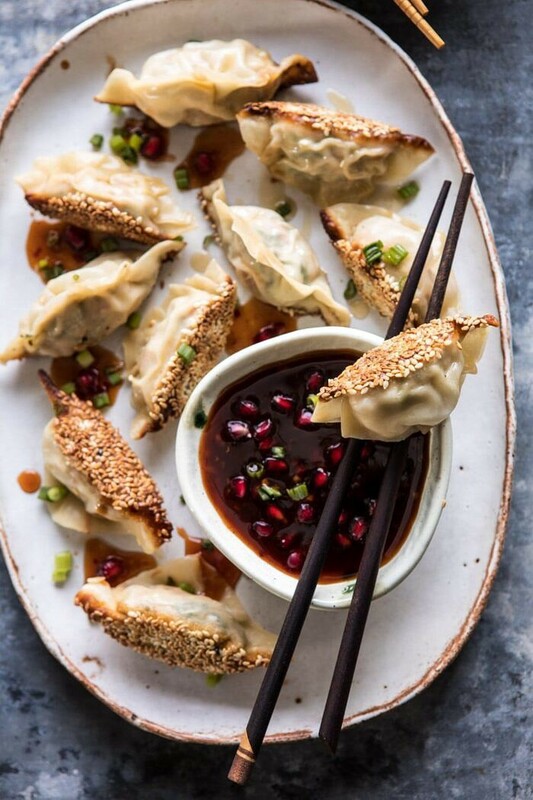 Ginger Sesame Chicken Potstickers with Sweet Chili Pomegranate Sauce. 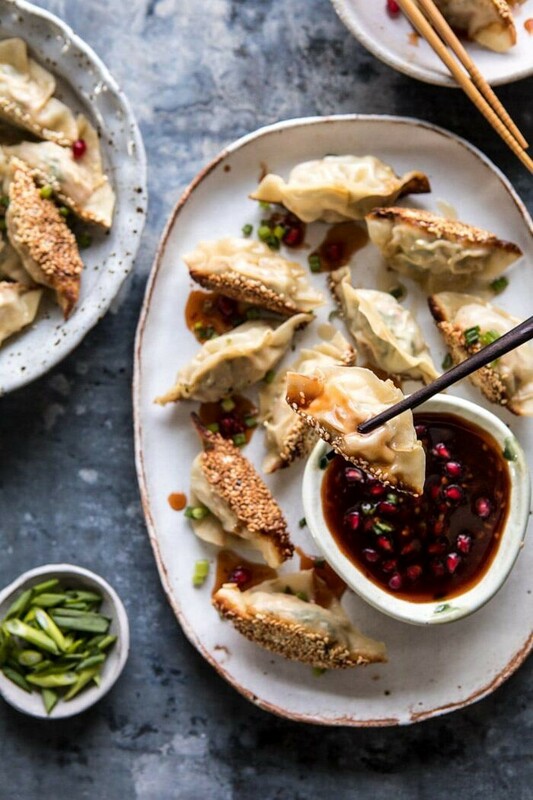 Better than takeout Ginger Sesame Chicken Potstickers with Sweet Chili Pomegranate Sauce. 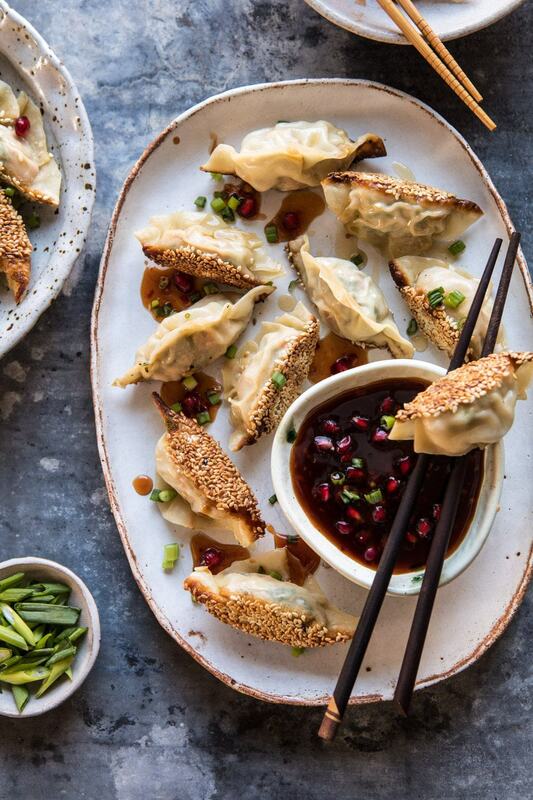 Easy homemade potstickers with chicken, ginger and sesame crusted wrappers, served alongside a sweet and spicy chili pomegranate sauce. These are a fun and healthy dinner to make any night of the week, or serve them up as an appetizer at your next holiday party! It’s true what they say, homemade is always better, and that’s definitely the case with these potstickers. I don’t know what it is about this time of year, but for whatever reason the cold weather always inspires me to stay cozied up inside and make homemade Asian inspired recipes. Well…along with a few cookies and hot chocolate as well. Our weekend presented us with single digit temperatures, plenty of snow on Friday and Saturday. And then bright, but cold sunshine on Sunday. Winter sure has arrived here, and I’m not sad about it at all. Absolutely loving the white snow and festive vibes. All the cold just makes it that much easier to stay inside and cook all day long. Which is good, since I’m currently in go mode to get ahead before all the holiday craziness really starts to set in. It might be cheesy, but nothing is better than cooking and baking up a storm on a snow filled day. I mean, right? I made these potstickers just the other week, as a last-minute recipe that turned out extra delicious. It’s funny, the recipes that I make spur of the moment tend to be some of my favorites. I was feeling like we needed a switch up in flavors. 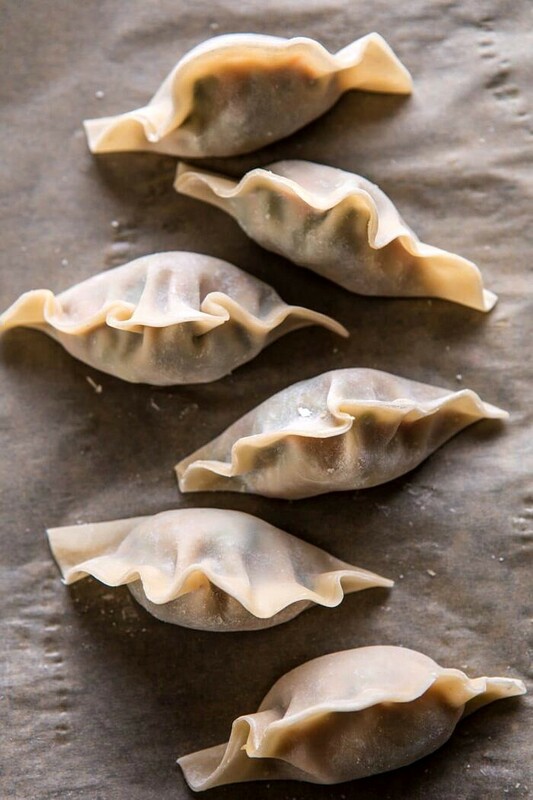 Plus I haven’t shared anything Asian inspired in a while…enter these potstickers. They’re possibly one of my personal favorite recipes of the last few months. Everything about them is so delicious. They’re both easy and fun to make, and the sweet chili sauce makes them semi addicting. For the filling, I wanted to keep things healthy, so I used a mix of lean ground chicken, shredded kale, lots of fresh ginger, and a little toasted sesame seed oil. It’s very simple, but very delicious. Stuff the mix inside store-bought wonton wrappers and then crust each potsticker in sesame seeds. The sesame crust on the outside is key here. I decided to do this at the very last-minute and it was a real game changer. As the potstickers cook, the sesame seeds become golden and toasted. They provide amazing flavor and add a nice crunch with each bite. For the sauce, I used one of my go-to secret ingredients to make a quick dipping sauce, sweet Thai Chili sauce. If you’ve never used sweet Thai chili sauce, please go out and buy some now. I use it whenever I want to add a sweet and spicy flavor to a dish, Asian or not. It’s beyond good and perfect to use as a dipping sauce. I added a little pomegranate juice for flavor. A splash of soy sauce for a little saltiness. And a few pomegranate arils for an extra burst of flavor and added texture. There’s just 4 ingredients, but this is so good, and perfect when paired with the gingery potstickers. These are sweet, spicy, a little crunchy, and all things delicious…and kind of addicting. There’s really nothing not to love. 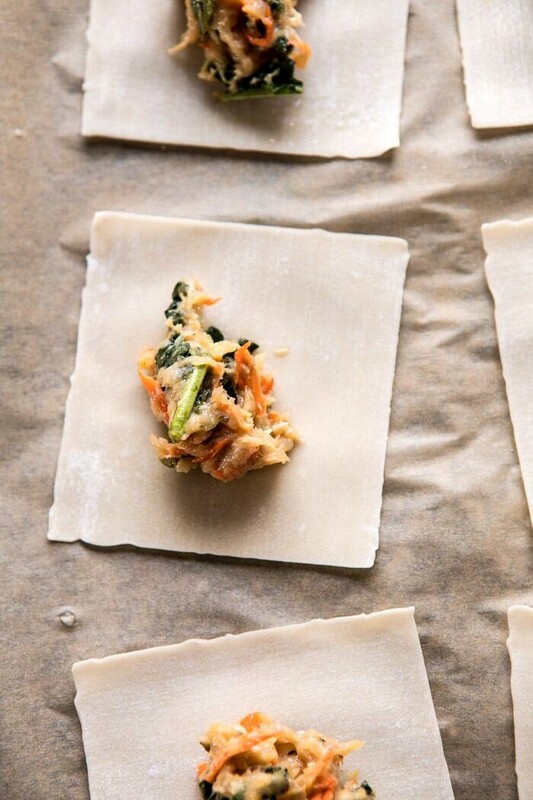 If you’re looking for something fresh and healthy…ish for dinner this week, make these potstickers. These will be the highlight of week. My idea? 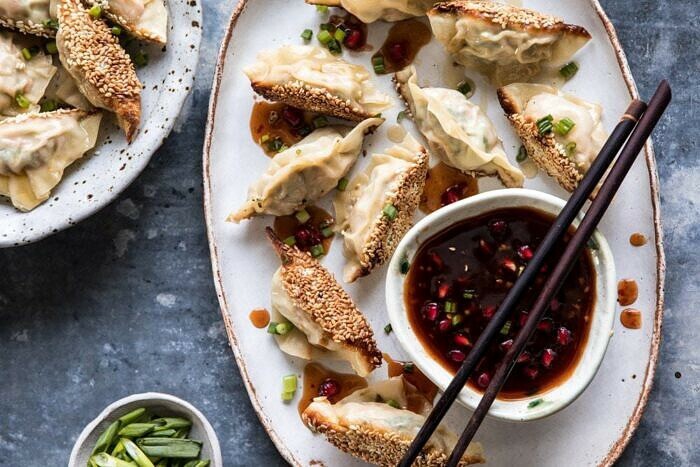 Invite your best friends over for a potsticker dinner. Then have everyone help assemble and cook the potstickers while enjoying your favorite drink and listening to Christmas music on repeat. This time of year is all about being with the people you love most. So let’s make potstickers while we celebrate the season. 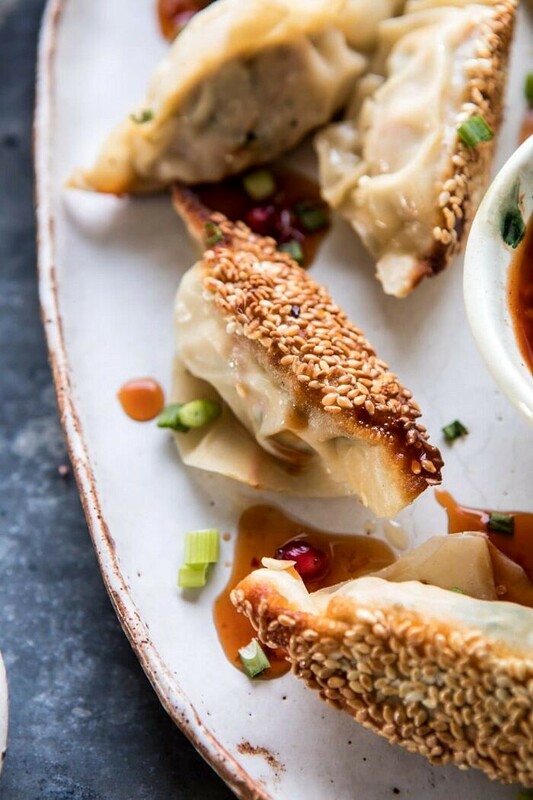 Trust me, this is a good idea, and these potstickers will become the latest addition to your monthly menu rotation. Bonus? You can freeze the uncooked potstickers. Then you’ll have them on hand anytime you’re craving a good Asian meal for a super fast and easy dinner. 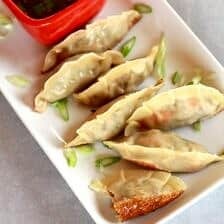 If you make these potstickers be sure to leave a comment and/or give this recipe a rating! Above all, I love to hear from you guys and always do my best to respond to each and every comment. And of course, if you do make this recipe, don’t forget to also tag me on Instagram! Looking through the photos of recipes you all have made is my favorite! 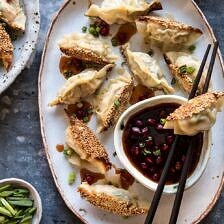 Easy homemade potstickers with chicken, ginger and sesame crusted wrappers, served alongside a sweet and spicy chili pomegranate sauce. A fun and healthy dinner to make any night of the week, or serve them up as an appetizer at your next holiday party! 1. In a medium bowl, combine the raw ground chicken, kale, carrots, ginger, garlic, green onions, soy sauce, sesame oil, and a pinch of black pepper, to taste. 2. Working with 1 wonton wrapper at a time, spoon 1 tablespoon of filling into the center of each wrapper. Brush water around the edge of the wrapper. Fold the dough over the filling to create a half moon shape, pinching the edges to seal. Repeat with the remaining wrappers. 3. Place the sesame seeds in a shallow bowl. Brush the bottoms of the potstickers with water and then dredge them in the sesame seeds. 4. Heat a few tablespoons of oil in a large skillet set over medium heat. When the oil shimmers, add the potstickers and cook until the bottoms are light golden brown, about 2-3 minutes. Carefully pour 1/4 cup of water into the skillet, it will splatter, so stand back. Immediately cover with a tight-fitting lid. Turn heat to medium-low and let the dumplings steam for 5-6 minutes, until the filling is cooked through inside. Serve right away with sauce (see below). 5. To make the sauce, combine all ingredients in a medium bowl. Serve alongside the potstickers. 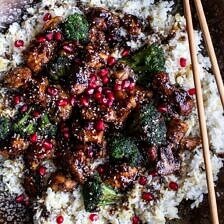 Pomegranate Sesame Chicken with Ginger Rice Pilaf. Thank you Cas! I hope you try these! Definitely can’t beat homemade, or cooking/baking-filled snow days! 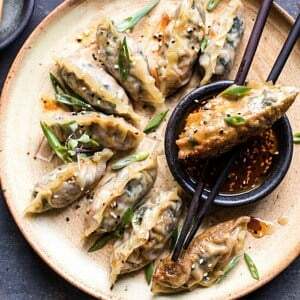 These potstickers are the perfect mix of savory and sweet (with the gorgeous jewel-like dipping sauce). Thank you so much Liz! I am so glad you liked this recipe! Does the meat need to be cooked prior to mixing it with the other ingredients? Hi Tieghan. These look delicious. Thinking about serving them as an appetizer on Christmas Eve. If I make them ahead of time and freeze them, do they need to be thawed before cooking? Thank you! Wow these look fantastic – YUM!! making these tonight! do I pre cook the meat?? Love the sesame seeds on the bottom of these! Will definitely be trying this recipe for family over the holidays! Thank you Kylie! I hope you love this! Made these yesterday( 6 times the recipe) and did not cook the meat, made potstickers gyosos and shu mai in the past without cooking the meat but between frying and steaming the meat has cooked. What are your thoughts as we made a ton!!!! Hi Ardina, I am sorry, I am confused. What are you asking? Dod the potstickers not cook properly for you? Any more info you can give would be helpful. Thanks! Loved these! They were a huge hit. We used ground turkey which cooked exactly as Tieghan said with the steaming….Also note that my son wouldnt part with the leftover pomegranate chili sauce and said that would be great on chicken tenders. Yes! I am so glad you and your family loved this Maura! Thank you! These potstickers look incredible, love the chili pomegranate sauce! Just made these for dinner as written (but with ground pork), they were delicious, so much flavor! I did make the first batch in my All Clad pan and at the end of the steaming process they were stuck to the pan. Switched the next batch to a non-stick pan, problem solved. I will be making these again! The meat mixture would also be good in lettuce wraps. Hi Jeanine! I am so glad you loved this recipe, that makes me so happy! Thank you! I love all of the veggies in the filling so it makes for a complete meal if you don’t want to make any sides. YUM! That is so amazing! I am so glad your family loved this recipe, Lisa! Thank you for making it! So excited to try these! I assembled them last night and they’re currently in the freezer. I have two questions though! 2) How many do you place in the pan at once when cooking? Would overcrowding prevent them from cooking as well? Any suggestions for a substitute for the Thai Chili sauce? It sounds amazing but I have a diet restriction that prevents me eating most of the bottles sauces etc. Can you make it from scratch? Thanks for the recipe I can’t wait to try it 😊! I didn’t get to make these back when you first posted this recipe, but am planning on having them this weekend. I’ve always cooked potstickers the exact opposite way, in that I steam them first and when the water evaporates, the dumplings brown in the oil left in the pan. If occurred to me that this recipe might not work that way, as the sesame seeds might fall off because they hadn’t been seared into the wonton skin prior to steaming. What do you all think would be best? Made these yesterday for my grandsons birthday party. They were gone as fast as I could cook them. Made them early in the day so I stored them in the freezer until everyone arrived. Cooked them as you said from frozen and they came out great. Love the sauce and will use it for other recipes. That is so amazing! I am so glad everyone loved these potstickers, Earl! Made these yesterday for my grandsons birthday party. They were gone as fast as I could cook them. Made them early in the day so I put them in the freezer until everyone arrived. Cooked them as you said from frozen and they came out great. Love the sauce and will use it for other recipes. Look forward to making these! Any recommendations for the sweet chili sauce? Just made these..OMG! These were delicious!!! I will definitely be adding into the rotation!! The sauce was equally as delicious!! This is a must try! Thank you so much! I am so glad you enjoyed this recipe! AH-MAZING! I made these last week and my family went crazy for them. They have asked for them again and again. In fact, my daughters are in the kitchen as I write this, making a double batch, dinner tonight and another for sometime soon in the future (I am going to freeze them). I agree, the sesame seeds to the potstickers to the next level and the sauce goes perfectly with them. Thanks! That is so amazing! I am so glad you all love this recipe, Barbara! Thank you so much! Can’t wait to make these tonight. 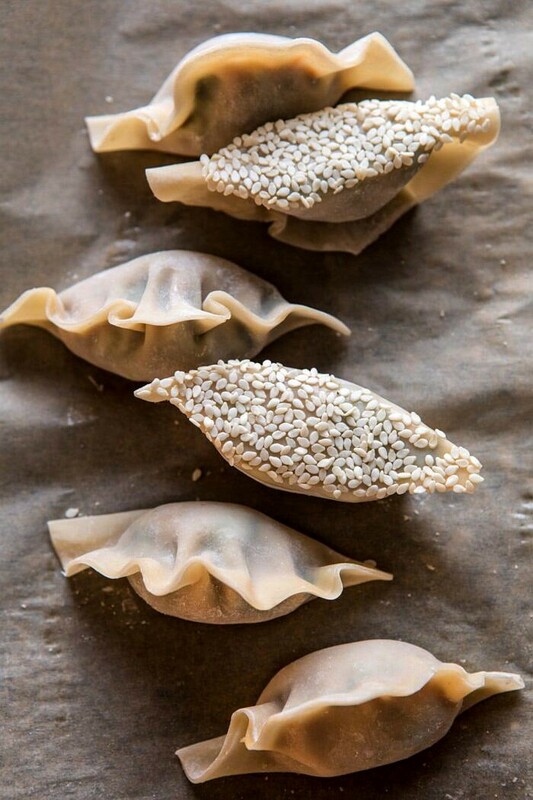 I have a simple recipe to make the wrappers and am so excited to try the sesame seeds! Thank you Kim! I hope you love these! Made these tonight for dinner. Delicious! My husband loved them too. That sauce! I used spinach instead of kale (not a fan) and it was great. Thanks for your daily recipe inspirations. I made your super green sun-dried tomato herb salad with crispy chickpeas a few weeks ago for a extended family dinner and everyone loved it. Sensational!! Used pork and followed the recipe as written. My nonstick scan pan worked wonderfully for this. The deeply toasted sesame seeds really boost the flavor. Can’t wait to make these again!!! I made these for dinner tonight. I love to cook, but have never made potstickers. When I read the recipe, the flavor seemed on point…….and I was right to trust you. The sesame seeds added crunch. The meat (I used ground turkey) was cooked and tender. The sauce was delicious. Thank you! Awesome!! I cooked half right after I made them and the rest I left refrigerated until the next day then cooked them. A huge hit!! T – would you ever consider revolutionizing the way recipes are published?!?! I would love it if someone would include the time it takes to prepare the ingredients, because prep time doesn’t cover it. Shredding kale, grating ginger, etc it all adds up and no one ever mentions it… And doing right is so key. Only thing is that they didn’t freeze well for me. It took them forever to defrost and then they all stuck together and the dough tore apart. They still tasted great though!! Made these for dinner tonight and they’re delicious! I loved the addition of the sesame seeds. I love this recipe. I have made it numerous times. But every time I make it, I find myself wondering what to accompany it with. I generally make it for dinner, not an app, as it’s time consuming but it always needs more to create a full dinner. I would even make something else as the main dish and have the pot stickers as the side dish. Thanks!